Growing up, people would always ask my parents why we would go time after time to Walt Disney World. I never really understood why people would ask these questions. The reason: it was a place where our entire family could enjoy our time together. We were able to leave the real world behind, be carefree, and see/experience something new no matter how familiar we were with the parks. As an adult, I get it. I now understand the magic of a Disney vacation on a different level. Before we go, I have everything planned. We have our entertainment built in, our resort has many options to offer, and even meals are booked and with the meal plan only tips need to be paid. By the time we arrive in Orlando, we have paid for everything except some souvenirs and ready to enjoy our time there. Back in March, when we were planning some dining reservations I told TechyDad that I had a request. 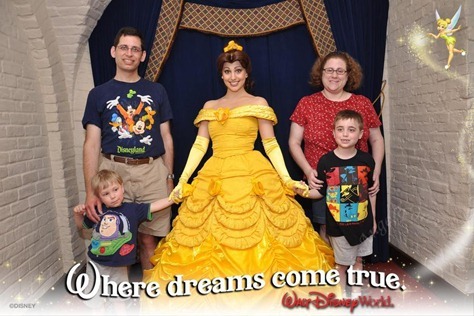 In all of my visits to Walt Disney World, I had never eaten with the princesses. Yes, this mother of two boys wanted to see Belle, Ariel, Arora, and other important ladies in Disney history. TechyDad was not entirely sure that it was the best thing to do with two boys, but I insisted. NHL and JSL were young enough to appreciate the experience without complaints about mostly girls in their princess gear being there. We were able to snag some lunch reservations to Akershus Royal Banquet Hall in Epcot. We had a magical experience. We had our photo taken with Belle before we were seated. Then, each of the princesses came around to meet and greet every table. What impressed me the most was how the characters interacted with the boys. Check out how Ariel noticed something in the autograph book and talked about pirates. A magical moment that we captured and can show back to the boys when they are older. Of course, we can also show JSL the goofy smile that he was sporting most of the trip when it was time for photos. While we were waiting for our dessert, I pulled out the video camera and asked NHL what he thought of the experience. I figured it would be interesting to see what a seven year old boy, with no sisters, had to say about dining with Disney Princesses. This is what he had to say in the very distracted environment. I do believe that we made the right choice going to this restaurant on our March vacation. I know it was a magical memory that will live with us for many years to come. If you have any magical Disney moments to share, I would love to hear them. As always, if you have any questions about Disney – just ask away. I took my niece to Disney world, and we had breakfast with the princesses. My niece was so happy to interact with the princesses, and cherishes the pictures she took with them to this day. Love the thumbs up! :) So I should take my boys while they’re still young? “Growing up, people would always ask my parents why we would go time after time to Walt Disney World. I never really understood why people would ask these questions.” Me too! It’s a win-win for us because it’s a great family-friendly place to go and a short drive away. Why *wouldn’t* we go?! BTW we’re going again next month. We check in Thanksgiving night and will be there for the weekend.